During the 1960's Chicago, Burlington and Quincy Locomotive No. 4960 pulled scores of special steam excursions in the Midwest. Now - 30 years later - she has been lovingly restored and has never looked better! 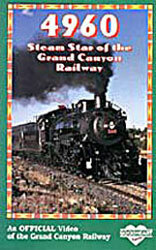 The Grand Canyon Railway began running steam to the canyon in 1989. Soon the railroad's popularity increased to the point where they needed a bigger locomotive to handle the ever-larger trains. The 4960 was just what they were looking for. We spent FIVE WEEKS at the canyon taping this locomotive in action, so you can enjoy the sights and sounds of the 4960! You'll see the first steam-up at the shop, the test runs, her Inaugural Run to the Canyon, a DOUBLEHEADER with No. 18 plus CAB RIDES with both the engineer and fireman wired for sound, explaining what they are doing as you ride with them!